There are some interesting photography books available that discuss how to work as a photographer. I thought I’d discuss a few of them in the same post as they are less about the art of photography and more about the realities of surviving as a professional. There are many books out there, these just happen to be four that are on my bookshelf. 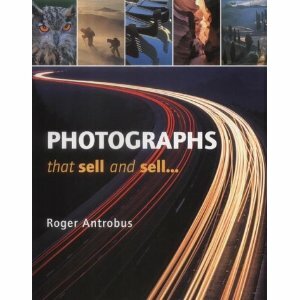 The first, Photographs That Sell and Sell… by Roger Antrobus is a brief introduction to stock photography. The book was published in 2003, and due to the changes in the stock industry, is now, in some respects, very out of date. The good points are that it explains how, if you can capture great photographs, it is possible to sell them as stock images to newspapers, magazines, and advertising. Antrobus shows examples of his images that made him a lot of money, and explains why he thinks they were successful. What is not discussed is that the price paid for stock images has crashed in recent years, while the number of people taking stock images has increased. The image of the light trails on the cover is a perfect example of this. It’s a good shot, but there are now thousands of similar images. The chances of still making money from a generic light trails image is pretty limited. Antrobus even titles one section “Stock photography provides a pension”. It’s a lovely idea, but I’d put some eggs in other baskets otherwise you’ll be going cold and hungry in your old age . 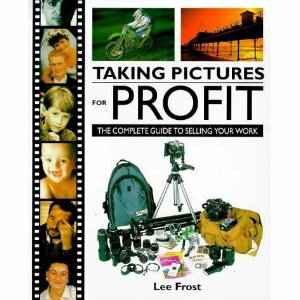 Taking Pictures for Profit by Lee Frost begins takes a broader approach to being a photographic mercenary. After a brief section on equipment, he writes about getting images into magazines, newspapers, calendars, and books. He then discusses photographing weddings, commercial assignments and portraits with examples of his own work and “Pro-files” of other photographers. Finally he has a section discussing stock imagery, in a similar way to the book by Antrobus. Professional Press, Editorial and PR Photography by Jon Tarrant was published in 1998. It’s descriptions of modern technology (Kodak DCS 520, pagers, automated film processing machines) are not much use, although it’s a useful reminder that even the latest equipment will become outdated and obsolete before long. It does however discuss the realities of being a working photographer, and the business side of being a professional. Dealing with clients, suppliers and even the taxman aren’t particularly glamorous aspects of the job, but they need to be considered. This was the first book I read that explained what to do if and when clients don’t pay. 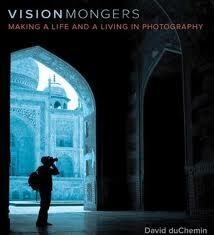 My most recent purchase, and by far the best of the group is VisionMongers : Making a Life and a Living in Photography. I bought VisionMongers having being impressed by duChemin’s previous book Within the Frame . As is to be expected, David duChemin is a great photographer, but he is also a talented writer. He has a good conversational tone to his prose, and what he has to say is useful or even insightful. In Within the Frame, he mentioned the idea that gear is good, but vision is better. In VisionMongers, a book on being a professional photographer, profit and selling (see titles of the first two books in this list) are secondary to vision and passion. The book came on sale only a few months ago so along with more traditional advice on starting a career, it also contains up to date guidance on branding, websites, blogs and even twitter. duChemin is however, not shy to discuss the financial realities of becoming a professional photographer. Having gone through bankruptcy himself he does not advocate a gung-ho approach to career transition, but discusses the various possibilities available. There’s a lot more to the book, but rather than have me ramble on, I simply recommend you buy a copy and read it. Well worth the money. I love visionmongers, it’s like talking with a true friend: very insightful, inspirational and real.